July 3, 2012 | Coptalk.Info - What you do not know will shock you! All of us suffer from it, the insatiable love affair with our automobiles. Everyday we drive the streets of America not realizing that disaster can strike at any time. But why think about an Earthquake, Hurricane, Flood, Tornado, Blizzard or the Hot Summer Heat when you are already to busy avoiding everybody else on the road with you and some how managing to talk on your cell phone, put on makeup, read the newspaper or shave. Too much to remember? What we are about to tell you is not an only needed, but if you plan on living long enough to make it to tomorrow, you not only need to remember it but you need to properly prepare yourself and your vehicle. I will be the first one to say that these disasters do not happen everyday, but when they do this following information can save your life. After almost every disaster, Search & rescue personnel find victims who might have survived if they had known whether to stay or leave their vehicles. The following tips are for drivers in various emergencies. EARTHQUAKES – Stay in your car! Bring you vehicle to a stop as soon as safely possible. Then remain in your vehicle until the shaking has stopped. Avoid stopping near or under buildings, overpasses and utility wires. The vehicle’s suspension will absorb a majority of the shaking and will shake the vehicle violently. But this is one of the safer places to be. When the earthquake has stopped, continue cautiously, trying to avoid bridges, overpasses, elevated structures or anything that may have been damaged by the earthquake or the aftershocks that may follow. Flooding can begin well before a hurricane nears land. Plan your evacuation early. Keep a full tank of gas in your vehicle so you can leave when emergency personnel tell you to. Learn the best evacuation route from your home. Make arrangements with friends or relatives inland to stay at their houses during the hurricane. Never attempt to drive hurricane. Wait until the all clear is given after the storm has subsided. Flash flooding can occur after a hurricane has passed. Avoid driving on coastal and low-lying roads. Storm surge and hurricane caused flooding are erratic and may occur with little or no warning. FLOOD – Get out of your car! There is no way to tell how deep standing water can be so don’t drive in if you don’t know how deep the water is. Water can be much deeper than it appears, and water levels can rise quickly. Most vehicles will float dangerously for at least a short time. A car can be buoyed by floodwaters and then quickly swept downstream during a flood. If your car stalls in floodwater, get out and quickly move to higher ground. The floodwaters may still be rising, and the car could be swept away at any moment. TORNADO – Get out of your car! A car is the least safe place to be during a Tornado. When a warning is issued, do not attempt to leave the area by car. If you are in a car, leave it and find shelter in a building. If a tornado approaches and there is no safe structures nearby, lie flat in a ditch or other ground depression with your arms over your head. BLIZZARD – Stay in the car! Try to avoid driving in severe winter weather. If you are caught in a storm and your car becomes immobilized, stay in the vehicle and await rescue. Do not attempt to walk to shelter unless you can see a definite safe haven at a reasonable distance. Disorientation during a blizzard comes rapidly and being lost in the snow is exceedingly dangerous. Turn on the vehicle’s engine for brief periods to provide heat, but always leave a window open for ventilation. Carbon monoxide can be deadly. Stay warm by clapping your hands and moving around. But try to avoid overexertion and exposure from shoveling or trying too push the car. Leave the dome light on as a signal to rescuers. If you are trapped with a friend, sleep in shifts. SUMMER HEAT – Stay out of a parked car! During hot weather, heat build up in a closed or nearly closed vehicle can occur quickly and intensely. Children and pets can die from heat stroke in a matter of minutes when left in a closed vehicle. Never leave anyone in a parked vehicle during periods of high summer heat. LISTEN to radio and television for the latest National Weather Service bulletins on severe weather for the are in which you will be driving. In the event of a disaster keep your radio or television on and await instructions. If evacuation is recommended, move quickly but calmly, following instructions as to route to be used, evacuation shelter to be sought and any other important directions. Keep them in you vehicle! Food: MRE’s, Canned foods, Camping Foods. Hopefully these items will help you to learn and understand the problems associated with disasters and disaster driving. Please contact your local Disaster Preparedness Associations for more information. 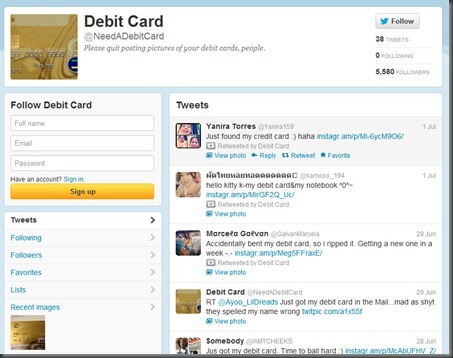 This page is dedicated to those who post photos of their Debit cards online.